Jerez de la Frontera is the birth place of sherry and of course when you're in the neigbourhood, one can't pass by without doing some sherry tasting. And so we did. There are tons of different bodegas to choose from in Jerez, but we opted for Tio Pepe. Really only because of their cute logo as I know absolutely nothing about sherry. But I was eager to learn and eager to drink. The Tio Pepe or Gonzalez-Byass bodega is located next to the big cathedral in the centre of town. It's not a small bodega so perhaps not the most intimate of tours we could've booked. The tour lasts for about an hour and a half and starts with a movie about the history of the Gonzalez-Byass legacy. This is followed by a walking tour among the barrels of solera which is a term that is used for the aging process the liquid goes through before it ends up in a bottle. 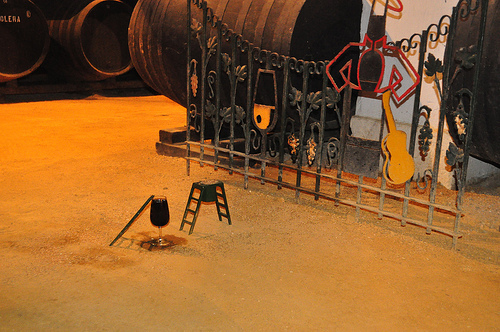 The tour continues through sheds and halls with more barrels where the guide tells us that the only resident of the bodega, which is a mouse, is well taken care of with its own little glass of sherry (which he/she drinks from a tiny ladder) accompanied with bits of cheese. We're shown barrels that are signed by famous visitors such as Kings and queens of Spain, but also people like Picasso, Senna and Churchill. Then we hop on a little train that takes us past some more halls and sheds and past a mini vineyard which acts as an example of what the real thing looks like located outside of Jerez. The tour ends with a tasting of two sherries accompanied with some crisps. After all I learned about this beverage, I'm eager to try, but still can't shake the thought that it smells and tastes like nail polish remover. So I give my second glass to my mum, who leaves the bodega in a very, very happy state. Maybe it's an acquired taste? I shall keep trying! We did the very same tour as you, Jaklien. Remember being told about the mouse. Also, the guide explained that the barrel signed by Francisco Franco had to be covered with glass as the phlegm directed that way by locals started to rot the wood. Understandbly, the dictator was not the most popular person in Andalusia. Haha, they didn't tell us that bit on our tour. I guess there was a lot of phlegm being flung then!